When your mane is unmanageable, it's time to take charge. Frizzy, dry hair that won't smooth out with the help of products and a blow-dryer needs a more solid option. The good news is that with the help of a trusted hairstylist, your hair can go from frizzy to free-flowing in just a few hours. The key is to find a permanent straightening solution made especially for your hair texture. After a few hours in the salon, your morning routine will be shorter and styling your hair will be easier than ever before. Whether your hair is au naturel, color-treated or chemically processed in some way, a keratin or Brazilian straightening treatment can help. This smoothing treatment puts natural keratin into your hair's cuticle to reduce fizz and add luster to your locks. A stylist applies the product, blow-dries your hair and then utilizes a flat iron to smooth out the frizz section by section. These treatments are said to release less formaldehyde than other smoothing treatments and allow hair to return to its natural texture in two to four months. Examples of keratin treatments include Keratin Complex by Coppola, Brazilian Blowout and Nanokeratin. 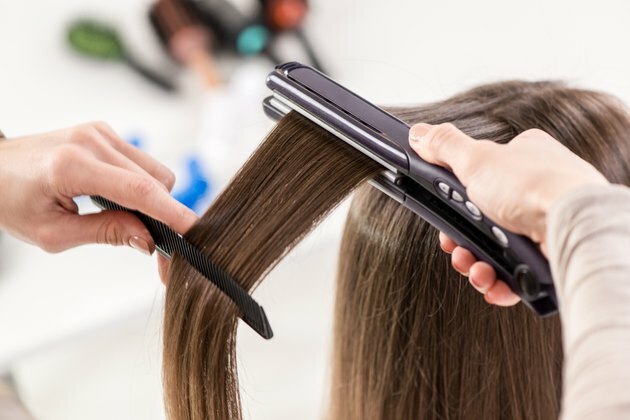 Japanese Straightening, also known as thermal reconditioning, is a process by which the hair's protein bonds are chemically broken so that they lay straight and smooth. The stylist saturates the hair with the straightening solution and then washes, dries and carefully flat-irons tiny sections around the the entire head. The best hair for this treatment is medium to long hair that isn't already colored or processed.The results are a little different than a keratin treatment -- in addition to smooth tresses, you're also getting permanently straight hair anywhere from four months to a year. If you have coarse, frizzy and medium to thick hair, you're a candidate for a chemical relaxer. Forget what you've heard about this permanent yet short-lasting de-frizzer; they've come a long way since the sodium-hydroxide days and cost a lot less than other permanent smoothing options. The downside to this treatment is that it only lasts six to eight weeks. Chemical relaxers can be done at home; make sure to do your research and apply the product exactly as directed on the package. Straightening options are permanent until regrowth appears. At that point, you can make a trip to the salon to get your roots touched up or have your entire head re-done. Another option is to purchase an over-the-counter smoothing treatment such as Keratin Perfect, Organix Ever Straight Brazilian Keratin Therapy or Ojon Super Sleek. These are good options if you're wanting to save on cash or simply desire to do the process at home. Make it a point to extend the length of your professional straightening treatment by using special shampoos and conditioners made to work in conjunction with the specific straightening system your stylist used.